You might think mice and rats are the answer to solving mankind’s medical afflictions. I thought so too until I read that the lowly fruit fly may hold the key to restoring memory in humans. 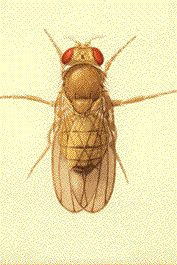 Turns out we have a lot in common, genetically speaking, with the common fruit fly, otherwise known as Drosophila. According to researchers at NASA's Ames Research Center , about 61% of known human disease genes match the little bugger’s genetic code. That’s why these flies have been used in myriad genetic experiments, ranging from the most seriously important research on why our two species like sweets to the less important issue of how to prevent cancer. So before you swat them away from that oozing and delectable ripe plum, remember that they are the soldiers on the front line of neurogenesis —a new way of generating brain cells. Just when we were feeling good about changing all those incandescent bulbs to compact fluorescents (CFLs), we learn that they're filled with two toxic chemicals--mercury and phosphor. But that's not all. If you break one, you're in for a massive, nightmarish cleanup. And what should we do about "dead" bulbs? How do we dispose of them? Here's the EPA on what to do when the bulb breaks. -Have people and pets leave the room, and don't let anyone walk through the breakage area on their way out. -Carefully scoop up glass fragments and powder using stiff paper or cardboard and place them in a glass jar with metal lid (such as a canning jar) or in a sealed plastic bag.